It was startling to see this magnificent creature outside the window of my apartment in the city. My apartment is right downtown - I mean, you can't get more downtown than it is, a few steps away from the Byward Market and the National Art Gallery and the Houses of Parliament. 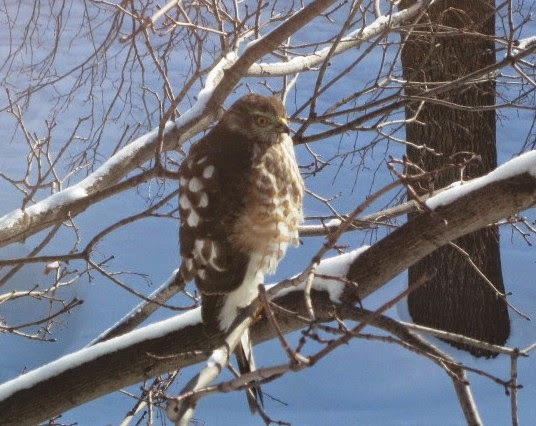 It is very common to see hawks at my place in the country, but not here in the city. Definitely a first - and very exciting! So I took a picture and then looked up hawks to see what kind it is. I think it might be a Sharp-Shinned Hawk, or maybe a Broad-shouldered Hawk, or maybe...I am really not sure. Any ideas?